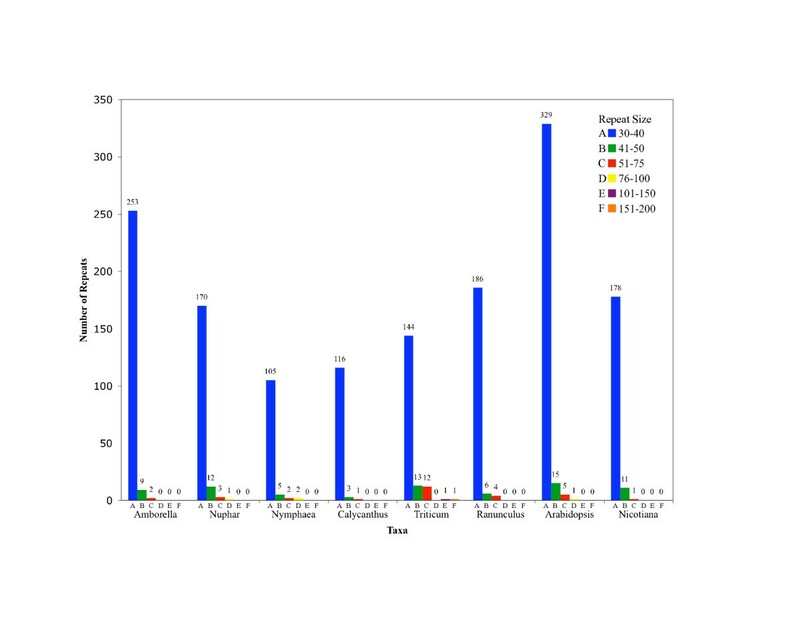 The number of completely sequenced plastid genomes available is growing rapidly. This array of sequences presents new opportunities to perform comparative analyses. In comparative studies, it is often useful to compare across wide phylogenetic spans and, within angiosperms, to include representatives from basally diverging lineages such as the genomes reported here: Nuphar advena (from a basal-most lineage) and Ranunculus macranthus (a basal eudicot). We report these two new plastid genome sequences and make comparisons (within angiosperms, seed plants, or all photosynthetic lineages) to evaluate features such as the status of ycf15 and ycf68 as protein coding genes, the distribution of simple sequence repeats (SSRs) and longer dispersed repeats (SDR), and patterns of nucleotide composition. The Nuphar [GenBank:NC_008788] and Ranunculus [GenBank:NC_008796] plastid genomes share characteristics of gene content and organization with many other chloroplast genomes. Like other plastid genomes, these genomes are A+T-rich, except for rRNA and tRNA genes. Detailed comparisons of Nuphar with Nymphaea, another Nymphaeaceae, show that more than two-thirds of these genomes exhibit at least 95% sequence identity and that most SSRs are shared. In broader comparisons, SSRs vary among genomes in terms of abundance and length and most contain repeat motifs based on A and T nucleotides. SSR and SDR abundance varies by genome and, for SSRs, is proportional to genome size. Long SDRs are rare in the genomes assessed. SSRs occur less frequently than predicted and, although the majority of the repeat motifs do include A and T nucleotides, the A+T bias in SSRs is less than that predicted from the underlying genomic nucleotide composition. In codon usage third positions show an A+T bias, however variation in codon usage does not correlate with differences in A+T-richness. Thus, although plastome nucleotide composition shows "A+T richness", an A+T bias is not apparent upon more in-depth analysis, at least in these aspects. The pattern of evolution in the sequences identified as ycf15 and ycf68 is not consistent with them being protein-coding genes. In fact, these regions show no evidence of sequence conservation beyond what is normal for non-coding regions of the IR. 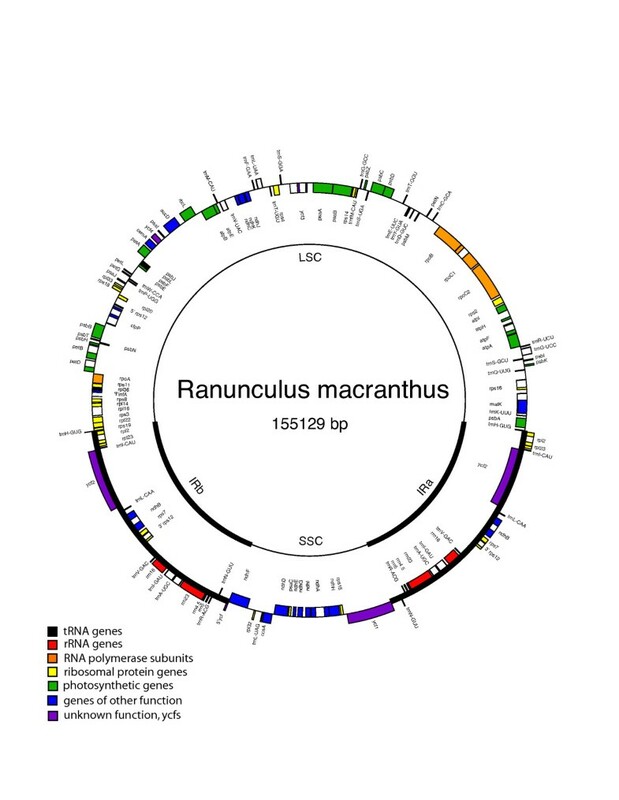 In this paper we report the complete chloroplast genome sequences of the angiosperms Nuphar advena (Nymphaeaceae) and Ranunculus macranthus (Ranunculaceae). The Nymphaeaceae is placed very near or even at the base of extant angiosperms [1–6], whereas the Ranunculus chloroplast genome represents the basal-most eudicot characterized to date [4, 5]. Thus we add to the small number of genomes not representing monocots or crown eudicots, increasing our ability to compare genomes across all angiosperms and determine general characteristics. Most chloroplast genomes in angiosperms (reviewed in: [7–9]) range from 135 to 160 kb and exist, at least in part  as single genome circles. In the majority of angiosperm chloroplast genomes two copies of a large inverted repeat (IR) of about 25 kb separate the remainder of the genome into two regions of unique DNA, the large (about 90 kb) and small (about 20 kb) single copy regions (LSC and SSC, respectively). Tobacco (Nicotiana tabacum), the first completely sequenced chloroplast genome , is most frequently used to contrast features of newly studied angiosperm cpDNAs and is parsimoniously inferred to represent the ancestral (or at least consensus) angiosperm chloroplast genome in terms of gene content and organization [7, 8]. This is reinforced by the similarity of the tobacco cpDNA to the basal angiosperms, Amborella  and Nymphaea , and the magnolids, Calycanthus Drimys, Liriodendron, and Piper . In some derived angiosperm lineages, this ancestral condition has been somewhat or highly modified via inversions, gene losses, presence or absence of ORFs and minor ycfs, and changes in IR extent [8, 9, 15, 16]. However, the tobacco-like pattern is widely distributed in crown eudicots, e.g., Panax , Eucalyptus , and Gossypium . Comparative chloroplast genomics as well as detailed characterizations of individual chloroplast genomes serve as the basis for functional genomic studies  and can direct attempts at chloroplast transformation for genetic engineering . In addition the chloroplast genome is an important source of genetic markers for phylogenetic analysis, population-level studies, genotyping and mapping that can be further exploited with additional genomic characterization and comparison. Detailed comparisons of genomic sequence have the potential, for example, to identify functional sequence outside of coding regions (promoters, terminators, replication origins, etc. 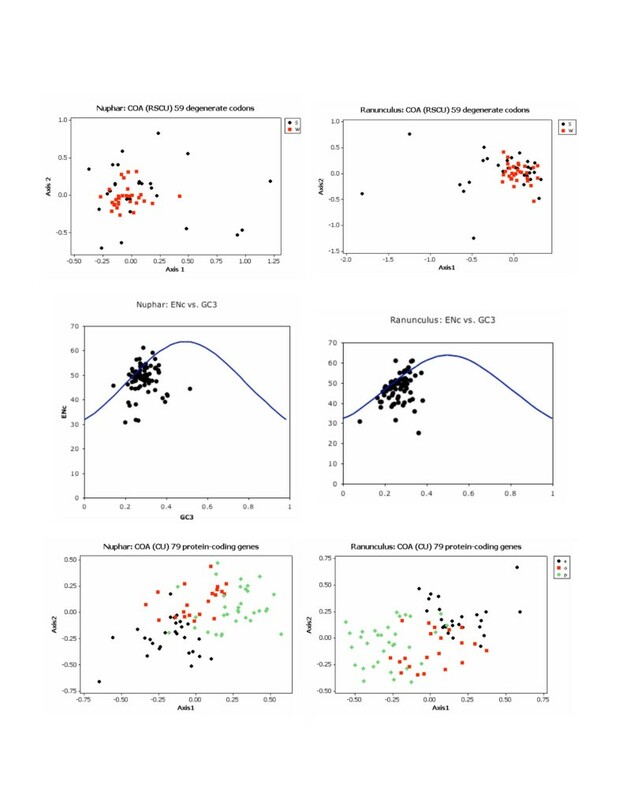 ), test the reality of hypothetical protein coding regions, make inferences about mutational rates and mechanisms, and detect selective signatures in gene sequences. Many fundamental aspects of the chloroplast genome are poorly understood and incompletely described. Here we use genomic comparisons to investigate the likelihood that ycf15 and ycf68 are not protein-coding genes, the occurrence of microsatellites or simple sequence repeats (SSRs), the presence of somewhat larger more complex repeats or small disperse repeats (SDR) and how nucleotide composition contributes to patterns of genome organization such as codon usage and repeat structure. Both the Nuphar [GenBank:NC_008788] and Ranunculus [GenBank:NC_008796] genomes exhibit the quadripartite structure common to most land plant genomes with large and small single copy regions (LSC and SSC, respectively) separated by two copies of the IR. The Nuphar chloroplast genome (Figure 1) is 160,866 bp in total length; the LSC is 90,379 bp, the SSC 18,817 bp and the two IR copies each 25,835 bp in length. In Ranunculus (Figure 2), the overall length is 155,129 bp with a LSC of 84,638 bp, a SSC of 18,909 bp, and two IR regions each of 25,791 bp. As is common to chloroplast genomes in general [5, 6, 9], the nucleotide composition of both of these genomes are biased towards A and T nucleotides, i.e., they are "A+T-rich". Overall the Nuphar genome is 60.9% A+T and Ranunculus 62.1% A+T. Different regions of the genome vary in A+T content, but all partitions are A+T rich with the exception of the two classes of RNA genes (Table 1). Linearized Nuphar advena plastome map. Genes are represented by boxes extending above or below the base line depending on the direction of transcription. The color of the gene boxes and the intergenic regions indicates the level of similarity of the region between the Nuphar and Nymphaea plastomes. Circular Ranunculus macranthus plastome map. Genes are represented by boxes inside or outside the circle to indicate the direction of transcription, clockwise or counterclockwise, respectively. The color of the gene boxes indicates the functional group to which the gene belongs. AT richness (%A+T) of the Nuphar and Ranunculus plastomes, overall and in various partitions. Although the two copies of the IR were not sequenced independently, the identity of the two copies could still be assessed. All random reads generated from the two IR regions falsely assemble in one location, but presumably about half of the reads are sequenced from one copy of the repeat and half from the other. If the two copies varied in sequence, one would expect, on average, half the reads to reflect one variant and half the other, but all reads that assembled into this region for both Nuphar and Ranunculus were identical in sequence. In fact, throughout the entire cpDNA of Nuphar, only one case of potential heteroplasmy was observed, where four reads indicated a run of 10 As and four others indicated 11. 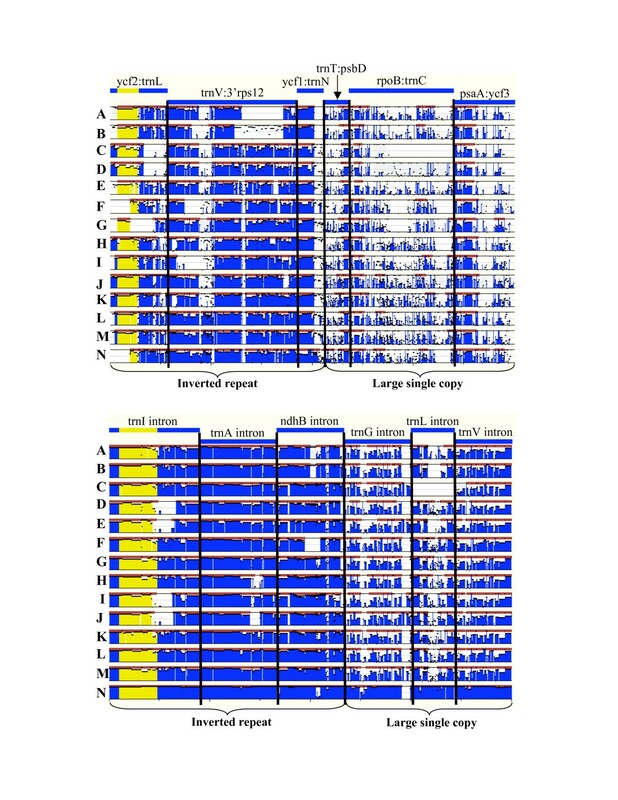 In Ranunculus no cases of high quality mismatch involving more than a single read were detected, even though multiple individuals contributed to the sequencing template. Nucleotide polymorphisms in chloroplast DNA sequences have been detected in several other groups. In the completely sequenced Pelargonium genome , 11 polymorphisms were detected and nine of these were located in the LSC. Unfortunately, it was not possible to determine if the differences in Nuphar or Pelargonium represent heteroplasmy because multiple individuals were used in both studies. 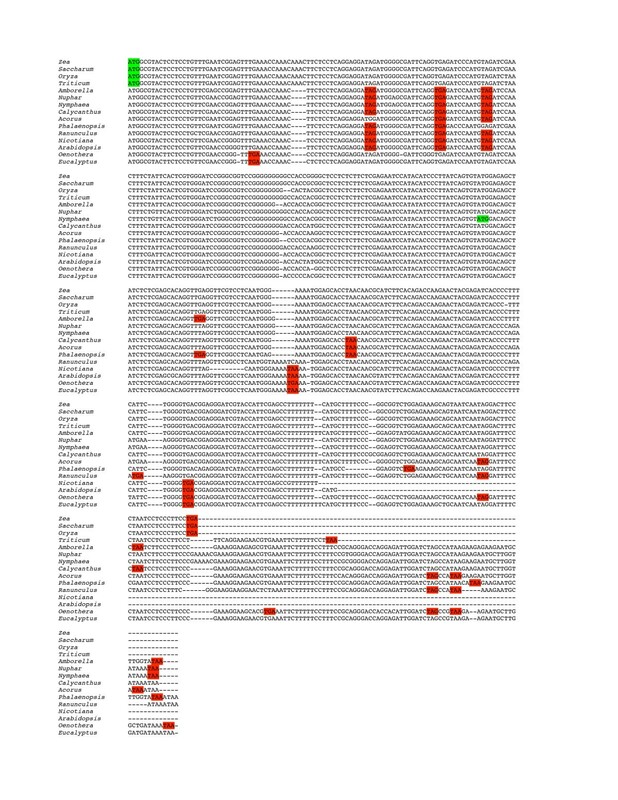 Heteroplasmy in the chloroplast genome has been detected in several other groups, including rice , Medicago , and Senecio . The IR extent in Nuphar and Ranunculus, as well as those of the basal angiosperms sequenced by Goremykin et al [12–14], were confirmed independently of the primary sequencing effort by PCR amplification and sequencing of the boundary regions. Although all these genomes contain IRs similar in extent to those of Nicotiana and many other angiosperms, some minor modifications were detected (Figure 3). As is common among angiosperms, a complete copy of ycf1 spans the SSC/IRA junction and the 5'end of the gene is duplicated at the SSC end of IRb. Among the comparisons shown in Figure 3, the amount of ycf1 that is duplicated ranges from 156 bp in Nymphaea to 1,583 bp in Amborella. At the LSC end of the IR, there is variation in these taxa over whether and how much of the gene trnH is duplicated. No part of trnH is duplicated in Calycanthus or Nicotiana but amounts ranging from one bp in Nymphaea to the entire gene (plus 140 bp of IGS) in Nuphar have been incorporated into the IR. The trnH gene has also been incorporated in the IR of Drimys but not in the other two recently sequenced magnoliid genomes, Liriodendron, and Piper . Large or complex changes in the extent of the IR should make distinctive markers of evolutionary lineages [25, 26]. However, given the small size of the changes discussed here and the relative ease of small (~100 bp) movements of the IR boundaries , the amount of ycf1 duplicated and the migration of trnH relative to the IR would not make very reliable phylogenetic markers. Comparison of inverted repeat-single copy boundaries in six representative angiosperms. Variation occurs at each of the four junctions. In Calycanthus rpl2 is not in the IR. JSB occurs within ycf1 in all of the genomes but the amount of the 5' end of ycf1 that is duplicated ranges from 156 bp in Nymphaea to 1583 bp in Amborella. Eleven bp of ndhF is duplicated in Nuphar but none of the other genomes shown have any duplication of the gene. JLA varies from including 5 bp of spacer downstream of trnH in Nicotiana to the inclusion of trnH and an additional 140 bp upstream sequence in the IR in Nuphar. The gene content and arrangement of Nuphar and Ranunculus plastid genomes (Figs. 1, 2) are identical with each other and with Nymphaea, Calycanthus, Amborella and Nicotiana (among others) except for details of the IR extent (described above), whether or not infA occurs as a pseudogene (in Ranunculus and Nicotiana) or a functional copy (the others listed), and the nature of ycf15 and ycf68 (see below). Seventy-nine different protein-coding genes (including, in this count, four hypothetical genes, ycf1, ycf2, ycf3, and ycf4), four rRNA genes and 30 tRNA genes occur in these genomes. Eighteen of these genes contain introns including two genes, clpP and ycf3, each with two introns, and one gene, rps12, also composed of three exons, but with the 5' exon separated from the two 3' exons. These features are common characteristics of land plant chloroplast genomes [9, 28]. The hypothetical gene ycf15 was first identified as ORF87 in Nicotiana  and has been included in the annotation of a subset of the completed land plant genomes. However, the validity of ycf15 as a protein-coding gene has been questioned [14, 18, 29]. Schmitz-Linneweber et al  found that the plastomes of Nicotiana, Epifagus and Cuscuta contain intact copies of ycf15, whereas those of Spinacia and Arabidopsis contain ycf15 as two pieces, with the 5' and 3' sections separated by 250–300 bp of 'intervening sequence'. They reasoned that if ycf15 is a functional protein in spinach, then the intervening sequence would need to be removed and the 5' and 3' sections spliced in order to make a functional ycf15 mature transcript. If the intervening sequence were not removed, numerous in-frame stop codons would lead to a truncated protein (Figure 4). Reverse transcription experiments in spinach determined that ycf15 was not spliced (although it was transcribed) and so presumably was not translated in spinach . They concluded that the ycf15 sequence, since it is highly conserved, probably has functional significance but probably does not code for a protein. Using an alternative approach, Goremykin et al  compared nucleotide substitution rates (dN/dS) in ycf15 and found a ratio that suggests ycf15 is not a protein evolving under evolutionary constraint. Alignment of the ycf15 region in six representative angiosperms. Atropa and Nicotiana represent the uninterrupted form. Codons highlighted in green represent start codons as annotated in the published genomes Atropa and Nicotiana. Codons highlighted in red represent stop codons in frame with those start codons. Although the sequence is highly conserved, it is not an open reading frame in most taxa. We examined the ycf2:trnL spacer region, where ycf15 is located, in several chloroplast genomes, including Nuphar and Ranunculus, to determine the distribution and nature of ycf15 (Table 2). Schmitz-Linneweber et al. , based on their small sample of taxa, suggested that the distribution of the interrupted versus uninterrupted ycf15 sequence, whether or not the sequence codes for a protein, might have phylogenetic significance. That indeed appears to be the case; all taxa, among those we examined, that contain an uninterrupted ycf15 motif are asterids and no asterid has the interrupted form (although some lack the 5' portion of the motif). We assume, based on the sequence similarity of the intervening sequence, that the Schmitz-Linneweber et al. finding of lack of splicing in Spinacia is likely to hold for other interrupted forms of the motif. The existence of the widely distributed interrupted form suggests that this is not a protein-coding gene in any of these genomes. If this truly is a protein-coding gene in the asterids, we would have to imagine that pseudogenes (as the interrupted forms would be, see Figure 4) are being retained, conserved over broad evolutionary distances, and either that the active form was inactivated multiple times by the insertion of the same intervening sequence at the same location or that an inactivated gene was re-activated in the asterids through the excision of the intervening sequence. Thus, we concur that ycf15 is unlikely to represent a protein-coding gene and so we did not annotate the sequence in either genome. Extent of ycf15 motif (as defined by the tobacco sequence) in published angiosperm chloroplast genomes. 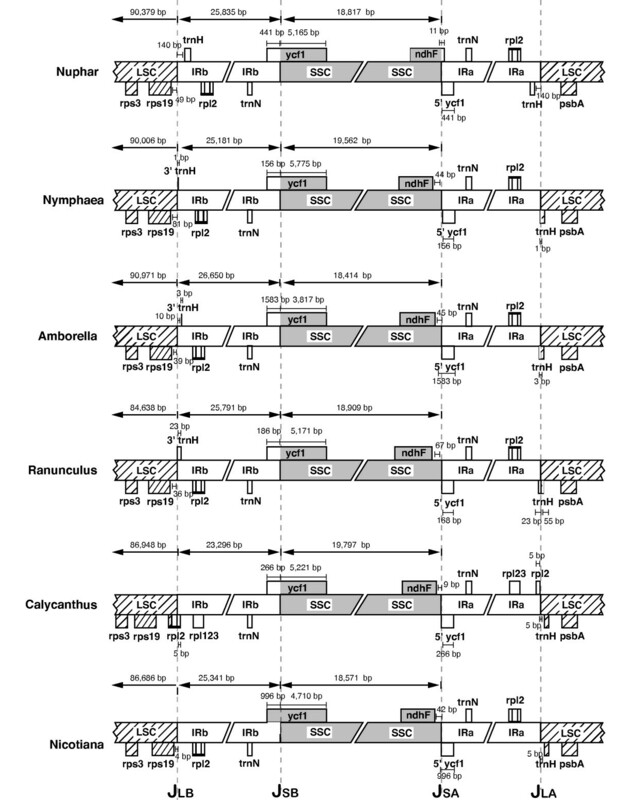 a ycf15 is 264 bp in the original annotation of Nicotiana, 147 bp in Amborella, 243 bp in Nymphaea and Calycanthus, 300 bp in 234 bp in Arabidopsis, 138 bp in Gossypium, 234 bp in Vitus, 213 bp in Atropa, 264 bp in Nicotiana sp. and Solanum sp., 264 bp in Lycopersicon, 162 bp in Helianthus, and 303 bp in Panax. Similarly a second hypothetical protein-coding gene, ycf68, also may not code for a protein. This conserved motif has been reported in the trnI-GAU intron of rice (ORF133), corn (ORF133), Pinus (ORF75a), Eucalyptus (ORF113) and Nymphaea. Wheat and sugarcane also contain an ORF in this region apparently homologous to that of rice and corn . We did not find an equivalent sequence in the chloroplast genome of any alga, which all lack an intron in the trnI-GAU gene, or in Selaginella, which lacks the trnI-GAU gene (Table 3). In the plastid genomes of all other vascular plant taxa examined, a similar sequence occurs in the trnI intron but in the majority of cases it contains numerous frameshifts and stop codons (Figure 5). Based only on its length and lack of internal stop codons, the ycf68 sequence could represent a functional protein-coding gene in the grasses, Nymphaeales, and in the gymnosperms Pinus thunbergii and P. koraiensis. However, in the others it can only be, at most, a pseudogene. Again, it seems unlikely that a non-functional gene could remain as conserved as the motif seen here over such vast evolutionary distances. If the sequence has any functional significance it must be other than coding for a protein, for example, in intron excision or in gene regulation. We did attempt to detect relationships between the conserved ycf68 motif and folding of the intron without success (see methods). We did not include ycf68 in the annotation of either Nuphar or Ranunculus. Distribution of the ycf68 motif in completely sequenced chloroplast genomes. b A complete copy of the motif is present but there are internal stops making it "non-functional"
Alignment of the ycf68 region in 14 representative angiosperms. Amborella, Nuphar, Zea, and Spinacia represent the form that includes intervening sequence. Codons highlighted in green represent start codons as annotated in the published grass genomes (Zea, Saccharum, Oryza and Triticum) and Nymphaea. Gorymekin et al identified a later start codon in their annotation of the Nymphaea ycf68 in order to maintain an open reading frame. Codons highlighted in red represent in frame stop codons (in frame with the grass start codon in the initial part of the alignment and in frame with the Nymphaea start codon once that point is reached). In either frame, these sequences, although largely conserved at the nucleotide level, are not open in most taxa. To further investigate the properties of these two "ycf s" we applied two additional approaches: 1) graphing codon usage patterns, following Echols et al. , of these putative genes relative to that of known genes and non-coding regions; and 2) comparing the level of conservation in the ycf15- and ycf68-containing regions with other similar regions using Mulan . Codon usage results were ambiguous (data not shown, see Methods). The Mulan results, though intuitive, were instructive (Figure 6). We compared the ycf15-containing intergenic spacer as well as five other similarly sized IGS (two from the IR regions and three from the LSC) to the homologous regions in Nicotiana, for each of 14 genomes (Figure 6 top). For ycf68, we did similar comparisons, using Zea as the reference taxon, of the trnI-GAU (ycf68-containing) intron, two other introns from the IR and three introns from the LSC (Figure 6 bottom). In both cases, but especially for the intron (ycf68) comparison, it can be seen that other IGS or intron sequences are as (or even more) conserved as the ycf regions and that non-coding sequences (introns or IGS) are much more conserved in the IR than in the LSC. Thus, it is seems likely that these regions (ycf15 and ycf68) are conserved, not because they serve some function, but simply because they are in the inverted repeat; they simply appear to code for a polypeptide chain of suggestive length due to chance and are conserved across large evolutionary distances because of the especially low rates of change within the IR . Sequence similarity comparisons of IGS and introns within the IR and the LSC. In both the top and bottom section, each 14 pairwise Mulan alignments is displayed as a histogram showing the similiarity (ranging from 50% to 100%) between each taxon (A-N) and the reference (Nicotiana top or Zea bottom). The height of the blue histogram topped by the horizontal black lines indicates the degree of similarity; similarity histograms are blue except where we have re-colored yellow the regions equivalent to ycf15 (top) and ycf68 (bottom) to highlight those regions. [The black horizontal lines without blue bars subtending them indicate short regions of similarity, basically SDRs. Red bars above the histogram indicate evolutionary conserved regions as determined in Mulan.] In interpreting the diagram, essentially the more blue (or yellow) in a region, the more similar are the two sequences. (Top) Comparisons, relevant to the conservation of ycf15, of six IGS regions from Nicotiana tobaccum were made to Calycanthus floridus (A), Amborella trichopoda (B), Zea mays (C), Saccharum officinarum (D), Phalaenopsis aphrodite (E), Lotus japonicus (F), Acorus calamus (G), Arabidopsis thaliana (H), Spinacia oleracea (I), Oenothera elata (J), Eucalyptus globulus (K), Nymphaea alba (L), Nuphar advena (M), and Ranunculus macranthus (N). (Bottom) Comparisons, relevant to the conservation of ycf68, of introns from Zea mays were made to those of Ranunculus macranthus (A), Calycanthus floridus (B), Eucalyptus globulus (C), Lotus japonicus (D), Spinacia oleracea (E), Phalaenopsis aphrodite (F), Nuphar advena (G), Nymphaea alba (H), Arabidopsis thaliana (I), Nicotiana tobaccum (J), Oenothera elata (K), Amborella trichopoda (L), Acorus calamus (M), and Saccharum officinarum (N). We examined codon usage patterns in Nuphar and Ranunculus for the 79 protein-coding genes (i.e., not including the hypothetical genes, ycf15 and ycf68). We compared start codon usage in ten representative genomes being careful to compare homologous positions as much as possible. [This was straightforward among seed plants but sometimes problematic with Huperzia.] For five genes in each organism (with some but not all genes held in common), either ACG or GTG appear to be used as an alternative to ATG as the start codon, as is common for a variety of genes in the plastid genomes of seed plants (Table 4). In the pteridophytes, Huperzia (Table 4) and Adiantum , even more genes (10 and 26, respectively) use alternative start codons, and the pteridophyte repertoire includes GCG and ATT, in addition to ACG and GTG. Alternative start codon usage in selected land plant genomes. Pseudogenes and ORFs were not included. Dashes in a cell indicate that that gene is absent from that genome. Overall codon usage in the Nuphar and Ranunculus genomes (Table 5) is generally similar to that reported from other genomes such as Panax , Lotus  and Nicotiana . As in these and other genomes [5, 6, 36–38] where the genetic code is redundant, codons with a third position nucleotide of A or T(U) are used more frequently than those terminating in G or C (Table 5). The base composition at each of the three codon positions varies, with the first position having the lowest proportion of A+T and the third position the highest (Table 1). It has been suggested that codon usage patterns are driven by this composition bias [39, 40]. However, when we apply methods to assess the impact of nucleotide composition on codon usage within Nuphar and Ranunculus, it appears that the A+T-richness of the third position is at most a partial influence on codon usage. We used CodonW  to calculate a variety of codon usage statistics that we then contrasted graphically (Figure 7). COrrespondence Analysis of codon usage (COA) was calculated based on codon usage as well as Relative Synonymous Codon Usage (RSCU). In each case the first two axes together explained only a modest amount of the variation (15–20%) and plotting each of the 56 degenerate codons on the first and second axes did not produce a pattern related to the A+T-richness of the third position in the codon sequence (Figure 7 top), except that codons ending in A or T are more tightly clustered than the codons ending in G or C. These results suggest that A+T-richness is not the most important factor in explaining variation in codon use. In addition we graphed each gene on the two axes ENc (the effective number of codons) and GC3 (the G+C percentage at the third position) (Figure 7 middle). If codon usage is random with respect to factors other than A+T-richness (i.e., GC content) of the third position, each gene is expected to fall on the prediction line for ENc based solely on its GC3 value [42, 43]. Again our results reinforce the finding that factors other than nucleotide composition are operating in the plastid genome to select among synonymous codons across genes, in that most points do not fall on the prediction line. Other studies, for example Wall and Herbeck's study of codon bias in the plastid gene rbcL , also have found that codon usage patterns are not explained by G+C patterns. Finally, we calculated COA eigen values for each gene for the Nuphar or Ranunculus genome (based on codon usage, RSCU or amino acid usage, the results are comparable although more obvious for codon or amino acid usage). The eigen values for the primary axes are higher (explain a higher proportion of the variation) than those seen for codons (about 25% in the case of the codon usage analyses) and plotting each gene on the first two axes produces patterns (Figure 7 bottom) suggesting that different functional groups of genes have different codon usage and amino acid usage patterns as has been found in broader comparisons [6, 36]. Overall, although A+T-richness of the third position is the most obvious pattern observable in plastome codon usage, other factors are important in determining codon usage patterns in particular genes (and perhaps genomes). Codon usage (codon frequency relative to each amino acid) for Nuphar (Nuad) and Ranunculus (Rama). Codons shown in bold complement the anticodons of the tRNAs encoded in the chloroplast genome. Frequencies shown in bold indicate the most common codon (where synonymous codons exist for that amino acid or termination). Graphical analyses of codon usage patterns. (top) Plots of the two most significant axes generated by the COA of RSCU values for Nuphar (top left) and Ranunculus (top right). Each point represents one of the 59 degenerate codons. The points are coded S (black circle) if the 3rd position nucleotide is G or C, and W (red square) if the 3rd position nucleotide is A or T. (middle) Plots of ENc (effective number of codons) by GC3 (the percentage G + C at the 3rd position) for each of the 79 protein-coding genes in Nuphar (middle left) and Ranunculus (middle right). The line in each graph (middle left and right) indicates the relationship predicted if codon usage was determined solely by 3rd position composition. (bottom) Plots of the two most significant axes generated by COA on CU (codon usage) for genes in Nuphar (bottom left) and Ranunculus (bottom right). Each gene is categorized as related to photosynthesis (green diamonds), gene expression (black circles) or other (red squares). Between the Nuphar and Nymphaea chloroplast genomes, we compared each individual gene, intron or intergenic spacer (IGS) region and calculated percent similarity (Table 6, Figure 1). For summary calculations, only one copy of each region in the IR was included and identities for multiple introns within a single gene were calculated separately. More than two-thirds of Nuphar regions match the homologous region of Nymphaea at a similarity level of 95% or higher; only 3% of the genomes fell below a threshold of 70% identity. As expected, coding regions are more highly conserved than IGS on average, although not in all cases. All four genes for rRNAs are 100% identical and those for tRNAs have at least 95% identity. Three protein-coding genes are 90–94% identical and all others are at least 95% identical. In some cases IGS and introns are more similar than coding regions – 60% of introns and 41% of IGS are at least 95% identical in sequence between the two genomes. Interestingly, the distribution patterns of the numbers of IGS and the numbers of introns in the different percent identity categories appeared quite similar, suggesting that similar forces may impact both types of non-coding sequences. Number of Nuphar plastome regions attaining different sequence identities relative to homologous Nymphaea plastome regions. Detailed percent identity comparisons are rarely reported for individual regions of entire chloroplast genomes. One study compared sugar cane with rice, maize and wheat and reported comparisons as one of three categories: 0–30%, 31–79% and 80–100% . As one might expect, most of the regions fell into the latter category. Timme et al. compared sequence divergence in both coding and non-coding regions between two completely sequenced chloroplast genomes from representatives of two of the subfamilies of Asteraceae. Their results showed that intergenic spacer regions were nearly two times as divergent as introns, and that the 10 most divergent coding sequences represent several different functional groups, including photosynthetic genes, ribosomal proteins, and ndh genes. Another study compared divergence within functional groups across four different species in three genera of Solanaceae and found that RNA and photosynthesis genes are the most conserved , consistent with the results from a second Solanceae comparison based on individual coding regions . Kim and Lee , in their comparison of coding regions (omitting the tRNA genes) from 16 fully sequenced vascular plant chloroplast genomes, found the four rRNA genes to be the least divergent, followed by psbA, psbD, rps12, psbE, psbL and petB. The most conserved coding regions in Nuphar-Nymphaea are similar in that the four rRNA genes, rps12, psbL and petB are also among the most conservative genes but differ in including petN, psbM, and rpl23 among the 10 most conserved coding regions. We also examined indels (insertions and deletions) between Nuphar and Nymphaea which, of course, are much more likely to occur in IGS than in coding regions. In our study, 88.6% of insertions and 89.9% of deletions occurred in IGS (data not shown), comparable to results from a similar comparison between sugarcane and maize where 84.9% of insertions and 74.2% of deletions occurred in IGS . In another study, the comparison of two varieties of rice (Oryza sativa) found 110 indels between those two plastid genomes , whereas we found almost four times as many (413), but, of course, our taxa are less closely related. 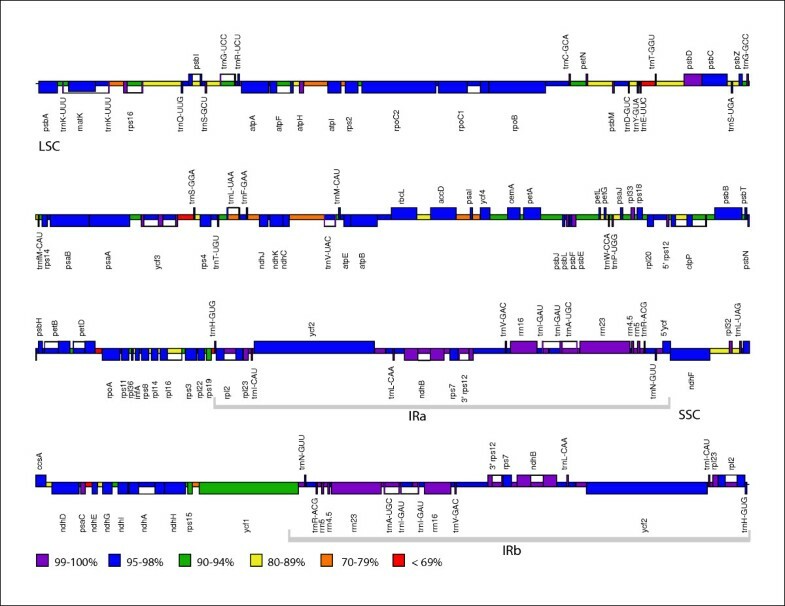 However a study comparing Atropa belladonna to Nicotiana tabaccum, a comparison perhaps more comparable to ours, found 65 insertions and 60 deletions equal to or larger than five bp in intergenic regions and introns , whereas we found 163 insertions and 206 deletions in Nuphar relative to Nymphaea. Together the combined lengths of the indels account for 0.08% of the total genome length of Atropa and 0.08% of the genome length in the rice comparison, but 0.23% of the genomic length in the Nuphar-Nymphaea comparison. Only recently have plastome sequences been available for closely related taxa, allowing for detailed comparisons [46–48]. These comparisons suggest that non-coding sequences within the genome evolve more rapidly in terms of both substitution and indel mutations, although this is not universally so (some non-coding sequences are quite highly conserved). Comparisons across studies show that some regions are consistently slow to evolve and others commonly evolve at a higher rate but at least minor differences are seen across these studies. Before general patterns and processes can be identified more genomic data allowing for such comparisons will need to become available. We screened for perfect SSRs in Nuphar, Ranunculus and 24 other chloroplast genomes (Table 7). We report the number of mononucleotide repeats ≥ 8 nt, dinucleotide repeats ≥ 8 nt (i.e., four repeat units), and trinucleotide repeats ≥ 9 nt (i.e., three repeat units); hereafter referred to collectively as the 8,8,9 SSRs. We also report the number of longer repeats ≥ 10 nt/repeats for mononucleotide runs, ≥ 10 nt (or five copies of the repeat unit) for dinucleotide repeats, and ≥ 12 nt (i.e., four copies of the repeat unit) for trinucleotide repeats; referred to collectively as the 10,10,12 SSRs. Of course, any particular threshold (e.g., 8,8,9) is rather arbitrary and no consensus has developed on what nucleotide length or repeat unit number is significant . However, it has been suggested that SSRs of length 8 nt or more (regardless of repeat motif) are prone to slip-strand mispairing (SSM, thought to be the primary mutational mechanism to affect SSRs), whereas those of lesser length are not . Elsewhere the critical threshold is estimated at 7–10 bp . Other workers have chosen similar thresholds, of 8 or 10 nt, in their reports [e.g., ]. The number of 8,8,9 SSRs vary from 152 in Pinus thunbergii to 393 in Lotus and comprise between 1 and 2.5% of the chloroplast genome. The number of 10,10,12 SSRs range from 16 in one of the rice genomes to 113 in Medicago. Number and maximum length of SSRs present in twenty-six land plant chloroplast genomes. We calculated, based on the data presented in Table 7, Spearman Rank Correlation statistics [using ] to look for relationships between the number of short and long SSRs and between genome size and the total number of SSRs (Figure 8). If some genomes are generally more likely to contain SSRs (due to differences in mutational biases or selection pressures or other factors) and a common mechanism (or suite of mechanisms) controlled the likelihood of SSR presence, then a correlation between short and long SSRs would be predicted. Alternatively if some genomes were predisposed to long SSRs whereas others were less likely for SSRs to attain greater length, then no correlation might be seen or even a negative correlation might be observed. 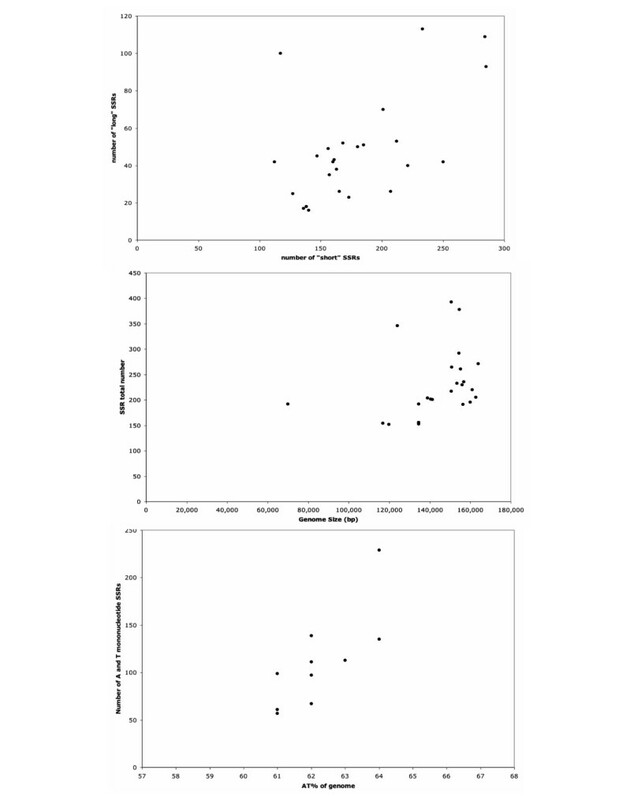 Genome size and total number of SSRs should be correlated if SSRs occur randomly. Both these comparisons showed a small but significant positive relationship. 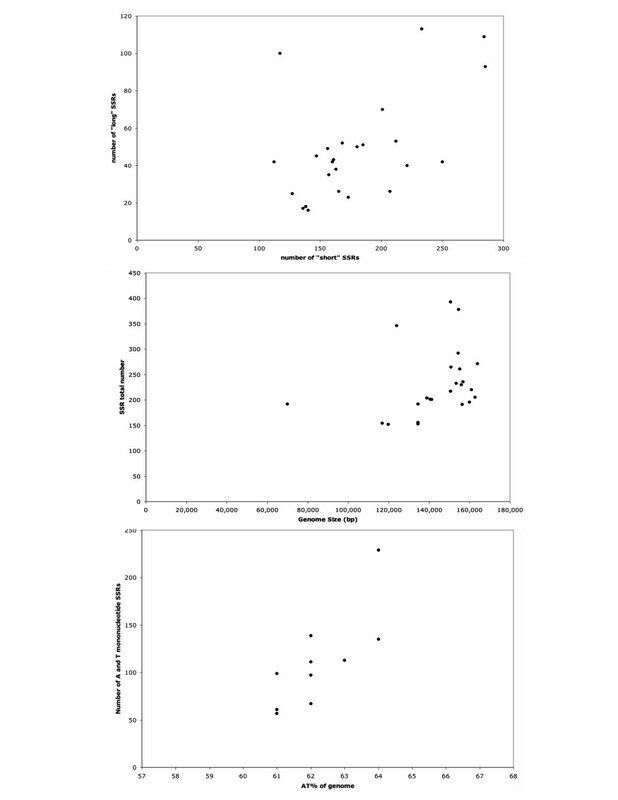 Genomes with a higher number of "short" SSRs (from the first to the second threshold) were more likely to have a higher number of "long" SSRs (at or above the second threshold) – Figure 8 (top), rs = 0.534, p = 0.009. Larger genomes were more likely to contain more SSRs than smaller genomes – Figure 8 (middle), rs = 0.542, p = 0.008 (rs = 0.524, p = 0.012 with Epifagus excluded). Thus we can infer that the larger the genome the more SSRs are to be expected and that "long" and "short" SSRs most likely are simply points on a continuum evolving under similar mechanisms. However these two factors explain only a portion of the variance in SSR number. Scatter plots showing relationships between aspects of SSR frequency and other characteristics. (top) The relationship of "short" SSRs and "long" SSRs. "Long" SSRs are the 10,10.12 repeats. "Short" SSRs are the 8,8,9 repeats with the 10,10,12 repeats excluded. These are shown for the 24 taxa in Table 7. (middle) The relationship between total SSR number and genome size (in nucleotides) for the 24 taxa. (bottom) The relationship of A+T-richness (the overall A+T percentage of the genome) and the frequency of A and T mononucleotide repeats for the 10 taxa involved in the more detailed comparison. No other SSR category showed a relationship to any aspect of nucleotide composition. For a subset of the chloroplast genomes, we conducted a more detailed comparison of the SSRs (data shown in additional file 1), including all of the then available basal angiosperms and basal eudicots, plus a pteridophyte, a conifer, two derived eudicots and one monocot. In these comparisons we characterized repeats based on nucleotide composition in addition to length and number. We then compared (data not shown) the predicted and observed number of repeats of various types and the predicted and observed ratios between repeats of various compositions. For all types of repeats, of all lengths and all compositions, in all genomes, fewer SSRs were observed than were predicted. In many cases the difference between the number of SSRs predicted and the number observed was more than an order of magnitude. For mononucleotide repeats in most angiosperms, the ratio of A or T (W) containing runs to G or C (S) containing runs was not significantly different from the ratio predicted from the genomic base composition. However, in the two Nymphaeaceae (Nuphar and Nymphaea), Pinus and Huperzia, the observed ratio of W to S mononucleotide SSRs was significantly different from the predicted ratio (Chi-Square test, p < 0.001). Interestingly the observed ratio was skewed in favor of S (G and C) containing repeats. When predicted ratios of dinucleotide repeats were calculated based on the overall nucleotide composition, all genomes showed a significantly biased ratio (Chi-square test, p < 0.001). In this case more WS SSRs were observed than expected and fewer WW SSRs. When the dinucleotide calculations were repeated based on the genomic dinucleotide frequencies, the deviation of the observed from the expected was less and for Arabidopsis and Triticum was not significant. Again where there is a deviation from expected, the WS category is elevated and the WW category is reduced in the observed. Finally, in calculations related to trinucleotide SSR compositions and based on overall trinucleotide composition, all but Arabidopsis and Triticum showed biased compositional ratios. Bias was due primarily to fewer WWW SSRs than expected. Thus, surprisingly, whenever the observed compositional ratio of SSRs was different from expectation (the majority of cases), the deviation was due to a deficiency of W (A and T) containing repeats. Other (non-plastid) genomes that are A+T rich have been found to exhibit a strong overrepresentation of A or T mononucleotide SSRs, e.g., Caenorhabditis elegans  and Plasmodium falciparum  and various explanations for this have been offered. Because A-T base pairs are held together by two hydrogen bonds rather than three, A-T containing repeats are easier to denature and therefore perhaps more prone to slip-strand mispairing (SSM). Other explanations include mutational bias (i.e., G-C to A-T mutations being more likely than the reverse ), involvement of A-T runs in gene regulation , and regions being more mutagenic due to A-T runs (this increased mutability being selected for in regions where higher mutations rates would be advantageous [56, 57]). Although these proposals seem reasonable, SSRs (and specifically A and T containing SSRs) are underrepresented in the plastid genomes in contrast also to the work of Dieringer and Schlotterer  who found SSRs overrepresented when comparing nine nuclear genomes. They predicted that the more biased from equal nucleotide composition the genome the greater the density of microsatellites (either mono- or di- nucleotide SSRs in their case). For the genomes considered in our detailed comparison, we tested for correlation between various aspects of nucleotide composition and SSR frequency. Only A and T mononucleotide repeat density correlated with genomic nucleotide composition (Figure 8 bottom, rs = 0.81, p = 0.015). So this correlation can be seen even when the W repeats are not over represented. G and C mononucleotide repeat density did not correlate with nucleotide composition and di- and tri-nucleotide repeat densities correlated neither with genomic frequencies nor with di- or tri-nucleotide frequencies calculated over the entire genome (data not shown). We note that GpC and CpG based (SS) repeats are completely absent from all the plastid genomes examined. This may be the result of selection against these motifs in addition to simple nucleotide composition (these would be predicted to be very rare; about one SS repeat of length 8 nt per genome on average) as SS-based dinucleotide repeats are absent or strongly underrepresented in other genomes as well [51, 58, 59]. Presumably some mechanism (mutational or selectional) in the chloroplast genome is acting on the plastid genomes such that many fewer SSRs are observed than would be expected and that mechanism is acting more strongly on W-containing repeats than S-containing ones. In an alternative attempt to clarify underlying patterns and mechanisms of SSR evolution, we compared the 10,10,12 SSRs between Nuphar and Nymphaea to determine how many of the SSRs were shared (determined by identity of flanking sequence and repeat position as well as repeat motif) between these two genomes from relatively closely related plants (additional file 2). The Nuphar genome contains more than twice as many 10,10,12 SSRs as the Nymphaea genome – 52 in Nuphar, 23 in Nymphaea. Sixty-six different 10,10,12 SSRs occur in the combined set. The vast majority, but not all, of the SSRs occur in non-coding DNA (55 in IGS, six in introns, and five in coding regions). The majority (50 of 66) of these repeats are shared between the two genomes; most are simply lower than the reporting threshold in one genome or the other. Of the 50 shared SSRs, only seven are the same length in both genomes. Where the shared SSRs are of different lengths, in 18 cases length differences were due to SSM, in 14 cases due to a nucleotide substitution, in four cases due to an indel (a length mutation other than a change in repeat unit number) and in eight cases due to a combination of mechanisms. Of the 16 SSRs not shared, 14 were found only in Nuphar and only two in Nymphaea. Thus, it appears that Nuphar is more likely to have these SSRs and for the SSRs to be longer when they occur; in 30 of the 43 cases where shared repeats differ in length the Nuphar SSR is longer. It is thought that SSRs begin as random runs of nucleotides [51, 60]. Any bias in mutation patterns or nucleotide composition would make certain runs more likely. Then, once present in a location, the repeat would grow via SSM [51, 57, 58, 60]. Longer SSRs lead to more stable heteroduplex intermediates, making SSM more likely . However longer SSRs also have higher mutations rates . One model of SSR evolution posits that the distribution of repeat lengths in a genome represents an equilibrium between SSM and point mutation . In the Nuphar-Nymphaea comparison SSM and point mutation occur with about equal frequency, consistent with this hypothesis. In terms of phylogenetic utility of SSR variation, the Nuphar-Nymphaea comparison suggests that individual SSRs are stable at least over relatively short periods of evolutionary time and that they do commonly vary in repeat number. However the small size of most repeats probably limits their utility and more needs to be known about the specifics of SSR evolution before any phylogenetic utility can be fully realized. Understanding more about the processes of SSR evolution will also help us investigate possible selective or functional roles for these motifs. We also searched for SDRs in the plastomes of representative angiosperms. These repeats are based on a more complex motif and are longer than SSRs. Our SDR analysis, within each of the eight genomes, identified 114–350 direct and inverted repeats 30 bp or longer with a sequence identity of at least 80% (Figure 9). The number of repeats was lowest in Nymphaea (114) and highest in Arabidopsis (350). In most cases, the number of direct repeats (62–208) was substantially higher than the number of inverted repeats (32–142). The vast majority (84–97%) of the repeats were only 30–40 bp in length and the longest repeat was 193 bp in Triticum. Blast comparisons of the repeats identified in each of the genomes were performed against all other genomes to locate shared repeats with an e-value of 2. Although these comparisons were performed using the repeats in each of the eight genomes as the reference, we only present the results (Table 8) using Nymphaea as the reference genome because it had the fewest number of repeats and thus would contain any repeats shared throughout all these genomes. Overall, the analyses identified 83 groups of shared repeats among these eight angiosperm chloroplast genomes, ranging in length from 30 to 49 bp. The majority of the shared repeats were located within intergenic spacer regions and introns. However repeats were sometimes found within genes and some cases represented inter-tRNA similarities within different families of tRNA genes. The largest shared repeat (49 bp) represents shared sequence between psaA and psaB. In general, the longer shared SDRs (36 – 49 bp) tend to have lower A+T-richness (at the level of the genome or lower). However, most (68 of the 83) of the shared SDRs are short, between 30 and 32 nt in length. This class of SDRs shows the widest range in A+T-richness (29% to 97%) but most exhibit A+T-richness of greater than 50%. Most shared SDRs are present in only a small number of copies. Only two repeats occur more than four times in the genomes (both are found in introns and IGS and exhibit A+T richness less than that of the genomes overall); one is 42 nt long (51% AT) and the other, occurring about 10 times, is 40 nt long (54% AT). Overall, no trends were detected between repeat location, number, length, and A+T-richness. Shared repeats among eight angiosperm chloroplast genomes. Repeats size is for Nymphaea, which was used the reference genome in Blast comparisons. Numbers in parentheses are percentage AT in each repeat. Numbers listed under each taxon indicate the number of copies of repeat shared with Nymphaea. The location indicates position of shared repeats. IGS = intergenic spacer. Repeated sequences are generally considered to be uncommon in chloroplast genomes with the notable exception of the large IR present in most land plants . Dispersed repeats are found more commonly in genomes that have experienced changes in genome organization [16, 61, 62], especially in highly rearranged algal genomes [63, 64]. A correlation between the number of repeats and the extent of gene order change has been suggested for algal genomes . However, comparisons of completely sequenced chloroplast genomes of the angiosperm families Fabaceae , Solanaceae , and Asteraceae  have revealed the presence of numerous small repeats scattered throughout these genomes even though these genomes have few if any rearrangements. In each of these families assessed by others, most of the repeats are 20 – 40 bp in length and they are located mostly in intergenic spacer regions and introns, although several are located in the protein-coding genes psaA, psaB, and ycf2. Our examination of repeats here in eight angiosperm chloroplast genomes, representing a wider phylogenetic diversity than that of earlier studies, identified numerous repeats in each genome of a nature and pattern similar to those reported by others based on narrower comparisons (Figure 9). Again here, some of the shared SDR repeats, such as those located in tRNA genes and those shared between psaA and psaB, result from conserved sequence similarity of related genes. The vast majority of the plastome SDRs are restricted to intergenic spacer regions and introns and are small in size. Earlier work suggesting that larger repeats (of a size detectable via Southern Hybridization) are rare in unrearranged plastid genomes is supported. However, the pattern that seems to be emerging from all of these analyses is that small SDRs in angiosperm genomes are quite common and they tend to be located in the same regions. The role of these conserved repeats is not known but given that many of them are shared broadly and are located in the same regions suggests that some may be functional. As additional chloroplast genomes from less-derived angiosperm taxa are characterized we obtain a clearer picture of the ancestral plastid genome organization for angiosperms. In large part these additional genomes (reported here and by others) confirm that the Nicotiana plastome is reasonably inferred to represent the ancestral angiosperm for gene content and organization, although perhaps not for exact IR boundaries. With notable exceptions, these features, seen in Nicotiana, are remarkably conserved in most angiosperm lineages. The Nuphar advena and Ranuculus macranthus chloroplast genome sequences add to this growing body of data for reconstructing the evolution of plastid genomes. The Nuphar genome, in addition, provided the opportunity for comparison with the relatively closely related Nymphaea alba plastome sequence. This comparison confirmed views on the conservative nature of the genome, with even some IGS regions showing very high levels of nucleotide similarity. The Nuphar-Nymphaea comparison also supported the view that SSR frequencies represent a balance between two mutation types: SSM and substitutions. Detailed comparisons among these and other genomes reveal many differences and unexplained conservation of features that both remain to be understood. However, we are able to suggest that the widely conserved sequences designated ycf15 and ycf68 are not protein-coding genes. As has been noted many times elsewhere, chloroplast genomes are biased towards A and T nucleotides, i.e., are "A+T-rich", except for the RNA genes. Howe et al. suggest that the A+T-richness of plastid genomes is the result of endosymbiosis (or at least enhanced due to endosymbiosis). They argue that there might be a selective advantage for a particular protein-coding gene to be either A+T-rich or G+C-rich and that each class of genes can be maintained through compartmentalization in the different genomes . However, many other genomes, prokaryotic or eukaryotic, are as A+T-rich as (or even more biased than) plastid genomes [31, 53]. We suggest that the plastome A+T bias is relatively modest and results from a slight mutation and/or error checking bias of the plastid DNA polymerases or perhaps some selection for A and T in otherwise neutral positions to increase ease of denaturation during replication or transcription. In any event, a bias can be seen in overall composition, in the composition of the 3rd position of codons, and in which SSR motifs are most abundant, among other aspects of the genomic sequence. However on closer inspection A+T richness does not correlate with variation in codon usage or details of SSR abundance. We speculate that the interesting patterns are those that fail to track patterns of A+T-richness; for example, repeat sequences in non-coding regions enriched for G and C are the ones more likely to be functional and understanding the components of codon bias that is not related to A+T-richness is more likely to be significant. Leaf material of Nuphar advena (Aiton) W. T. Aiton was obtained from a cultivated plant (vegetatively propagated from wild material from Lake Moshanon, Center County, PA) in the Biology Greenhouse at Pennsylvania State University. A voucher made from this same plant (collection Claude W. dePamphilis 2001.301) was deposited at PAC. Ranunculus macranthus Scheele leaf material was collected from a wild population in Austin, TX. Leaves from multiple individual plants were combined to provide enough material for the cpDNA isolations. A voucher was made from a plant from this population and deposited in TEX. Nuphar advena chloroplast DNA was prepared by the sucrose gradient method . However, the sucrose-gradient method did not yield pure enough cpDNA from Ranunculus macranthus. Therefore, for Ranunculus macranthus the NaCl method  was used and yielded concentrated, sufficiently pure cpDNA and was used as the sequencing template. Our isolation methods are described in detail elsewhere . Details of our methodology for producing finished genomic sequences from the sequencing template (cpDNA in this case) are provided in Jansen et al . We will provide an overview of our approach here. Draft genomic sequence was prepared from the cpDNA preparations at the DOE Joint Genome Institute. To do so, the DNA was sheared by passage through a narrow aperture and then fragments averaging 3 kb were selected from an agarose gel and cloned into plasmids, which were then used to transform E. coli. Clones were randomly selected from these libraries and placed into 384-well plates and templates amplified for sequencing using rolling circle amplification. When sequenced, forward and reverse plasmid sequencing primers produced 500–750 bp of sequence data (reads) from each end of the inserts. The individual reads were then processed and assembled into contigs using Phred and Phrap [70, 71]. Four or five plates (generating 768 reads each) provide 8–10× coverage if the library is 60–80% cpDNA. In the case of Nuphar, one library was constructed. The sequencing reads from five plates assembled into a draft genome composed of a single contig. In the case of Ranunculus, three libraries were constructed and fourteen plates of sequence data were generated. These data assembled into a draft genome composed of a single contig. The draft sequences were then assessed visually using Consed  to determine the level of quality of each nucleotide. Each nucleotide in each read was assigned a quality score using Phred . Our minimum criterion was two reads with a quality score of ≥ 20 for each position. At the vast majority of positions this criterion was greatly exceeded, but occasionally areas of low coverage occurred and there were some instances where the minimum criterion was not met. In those cases, we designed primers to flank the regions of these "quality gaps", PCR amplified a product that contained the questionable nucleotide or nucleotides, and sequenced the PCR product until the criterion was met. Five regions of low quality were confirmed in this manner in Nuphar and two in Ranunculus. We also confirmed the extent of the IR with a PCR and sequencing strategy. In the shotgun sequencing approach, the two copies of the IR are not sequenced separately. Like the remainder of the genome, the sequence for the IR region is built up via the overlap and assembly of the 500–700 bp sequencing reads. Sequences derived from templates representing both copies of the IR assemble together. The IR can be recognized generally in Consed as the depth of sequencing reads doubles in that region and the boundaries can be inferred where the two reads from a single clone assemble far from each other. However to precisely define the boundaries we designed primers to amplify across each of the four IR-single copy junctions, sequenced the PCR products and compared those sequences to one another and to the draft genome. In this manner we were able to confirm the precise location of the IR-LSC and IR-SSC boundaries. We used DOGMA  as our primary tool for annotating these two genomes. DOGMA uses BLASTX  to compare the genomic sequence against a custom database of genes constructed using corrected annotations of 17 completely sequenced chloroplast genomes. This produces a draft annotation that is then inspected using DOGMA's tools for accurate assessment of the start and codon of each gene and any contained exon-intron boundaries. Because of the limitations of BLAST searches, small exons (6–9 nucleotides) that occur in three chloroplast genes cannot be found by DOGMA or by using other versions of Blast searches, so these were located manually. Putative gene and exon boundaries are determined by detailed comparison with other annotated genomes and individual gene sequences; no expression or protein studies were conducted to confirm the assignments. 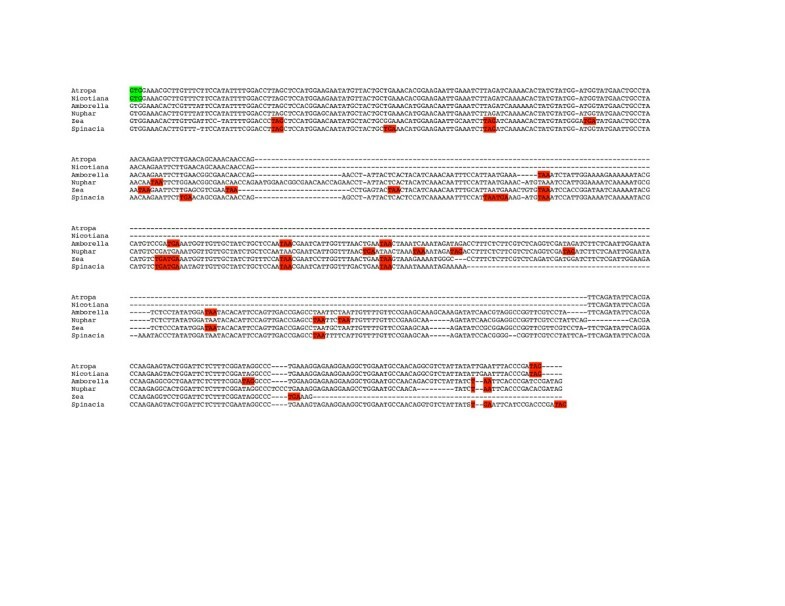 To investigate the distribution and nature of ycf15, we extracted the ycf15 sequence from the Nicotiana tabaccum genome (NC_001879) and conducted pairwise BLAST searches between this and each of the 63 then-available complete chloroplast genome sequences. If any portion of the ycf15 sequence was not detected in comparisons against whole genome sequences, the ycf2:trnL spacer region was extracted and just that portion of the genome was compared to the Nicotiana ycf15 sequence. ClustalW  alignments were also conducted to assess levels of conservation in a subset of genomes. Pairwise BLAST (bl2seq ) was also used to assess ycf68 distributional patterns, here using the ycf68 sequence from Zea and Nymphaea against all 63 then-published plastid genomes. Also, since ycf68 is found in the trnI-GAU intron, it seemed possible that the conserved sequence could be related to folding during excision. The trnI-GAU intron was extracted using NCBI or DOGMA from all the species listed in Table 3 that contain an intron in trnI-GAU and folded using the web-based programs mfold  and DINAmelt  using default settings. We then examined the folding patterns to look for regions with conserved folding domains. We saw no obvious correlation between the position of the region of sequence similarity and the folding structure hypothesized by either program. Another method for investigating the functionality of an ORF was designed by Echols et al. . They looked at codon usage in pseudogenes, genes, and intergenic regions to determine how pseudogenes were evolving and if amino acid frequency could be an indicator of the functionality of a conserved region of DNA . They separately calculated the frequency of amino acids in coding, noncoding, and known pseudogene sequences and then graphed the results to display trends of usage in the three sequence types. They found that the amino acid frequency in pseudogenes was an exact intermediate between amino acid frequency in known genes and intergenic DNA, and argued that this method is a valid way to determine whether or not a gene is functional . We used this method to investigate whether or not ycf15 and ycf68 had amino acid frequencies similar to coding, noncoding, or an intermediate to differentiate among the hypotheses that the ycfs are genes, pseudogenes, or simply non-coding DNA. Algorithms from web-based suite of tools BABEL  were used to calculate the frequency of amino acids. For Ranunculus and Nuphar, we input all coding DNA sequences and recorded the amino acid frequency. We determined codon usage in the noncoding sequence by averaging the codon usage for each reading frame (the difference in frequency among the six reading frames is minimal) to get a frequency estimate. BABEL tools  were also used to calculate amino acid frequency in the intron sequence of trnI-GAU and the ycf2:trnL-CAA intergenic region. These results were then graphed. In the Echols et al. analysis the amino acid frequency for each amino acid was graphed in order of decreasing levels of variation. We tried multiple methods for arranging the amino acids including that of Echols et al., alphabetical, high and low frequency, standard deviation of the frequency across all types of DNA, etc. We found that manipulation of the order of amino acids on the X-axis changed the results so much that we could display evidence for any of the hypotheses under consideration. Therefore, we do not believe that this type of analysis is valid, at least not with our data. Perhaps with the larger sample sizes, from nuclear genomes, available to Echols et al. the approach is more consistent. We further investigated the characteristics of ycf15 and ycf68 by comparing sequence similarity of the trnI-GAU intron and the intergenic spacer between ycf2 and trnL-CAA to other introns and intergenic spacers throughout the chloroplast genome to see if the intergenic/intron regions containing ycf15 and ycf68 are more conserved than that of other noncoding DNA in the chloroplast genome. We used the web-based program Mulan  to compare noncoding DNA in our sequences to a reference sequence – Nicotiana tabacum for ycf15 and Zea mays for ycf68. Mulan performs pairwise sequence comparisons of the input sequence to the chosen reference sequence. We used the default setting of 100 for the ECR (evolutionary conserved region) length, the minimum amount of base pairs that have to align for similarity to register on the histogram, and 50 percent for the ECR similarity. The algorithm then returns graphical information about the likeness of the input sequences to the reference sequence; output is in the form of a histogram showing the similarity of the sequences from 50 to 100 percent. To see if introns were commonly conserved at a level equivalent to that represented by the ycf68 motif, we compared the intron in trnI-GAU with a sample of other introns within the inverted repeat (trnA-UGC and ndhB), and in the large single copy region (trnG-UCC, trnL-UAA, and trnV- UAC). To investigate conservation of the nucleotide sequence in the ycf2:trnL intergenic spacer, relative to the ycf15 question, we compared it to intergenic DNA that is outside of known operons in the inverted repeat (3'rps12:trnV-GAC and trnN- GUU:ycf1) and the large single copy region (rpoB:trnC-GCA, trnT-GGU:psbD, and psaA:ycf3). Alternative start codon usage was determined based on published annotations with additional comparisons. All genes annotated with an alternative start were aligned to determine whether or not the start was homologous with non-alternative start codons in other taxa. If the annotated alternative start was the result of a longer or shorter annotation, the region homologous to the start codon of other taxa was examined to determine whether or not the normal start codon was present. Codon usage patterns for each genome were determined using FREQSQ from BABEL  and CodonW . The predicted relationship of ENc and GC3 was determined using Wright's equation as given by Novembre . The equation as printed in the Wright 1990 paper  contains a typographical error. The complete chloroplast genome of Nuphar was sub-divided into individual coding and non-coding regions, and each region was compared against the entire Nymphaea genome using the BLAST2 algorithm  available on the National Center for Biotechnology Information website. The output files from BLAST2 were used to determine the percent similarity of each region. BLAST2 presents errors when one sequence under comparison contains mononucleotide repeats with runs greater than six nucleotides; n is indicated in place of each repeating nucleotide at those positions and considered "non-matching" in similarity calculations. These errors were checked against the genome sequences and corrected before calculations were made. Nucleotide sequence fragments that BLAST2 did not align (and did not show) were scored as zeros and negatively affected the % identity value. For example if only 425 of the known 450 nucleotides in a gene were aligned by BLAST2, and it was otherwise a perfect match, then the % identity would be 425/450 or 94.4%. BLAST2 does not display insertions or deletion events (indels) of greater than 10 nucleotides; such a disparity between the sequences would lead to the two adjoining regions of similarity being displayed as separate regions of identity. We looked at indels as well as nucleotide similarity. We characterized indels as insertions or deletions relative to Nuphar. If Nuphar contained sequence for which there was no equivalent in Nymphaea is was considered an insertion, whereas if nucleotides in the Nymphaea sequence lacked a Nuphar equivalent it was a deletion. We used BLAST2  to quantify indels in coding regions only. MULAN  was used to produce a total genome alignment for Nuphar and Nymphaea. Indels in the entire genome were quantified using this output. Simple subtraction of the coding region indels from the total number of indels provided the number found in intergenic regions. We quantified indels of 5–9 bp, 10–19 bp and 20 or greater bp. To locate and characterize SSRs in these genomes, we used the Simple Sequence Repeat (SSR) Extractor Utility . We screened for all perfect mono-, di- and tri-nucleotide repeats of length at least 8,8, or 9 nucleotides, respectively. We also determined the number and nature of mono-, di- and tri- nucleotide repeats of length at least 10, 10 or 12 nucleotides. In addition to analyzing SSR content of Nuphar and Ranunculus, we examined the chloroplast genomes of the other completely sequenced land plant genomes available at the time of the analysis. These chloroplast genome sequences were obtained from GenBank (accession numbers given in Table 7). To assess possible relationships between the number of longer SSRs and the number of shorter SSRs as well as the number of SSRs and genome size and A+T-richness and frequencies of particular SSR motifs, we conducted Spearman rank correlation tests using an online calculator . Predicted numbers of SSRs of particular composition were calculated based on the underlying compositional nucleotide frequencies. For example, if A+T frequency in the genome overall is 0.638 then the frequency of a mononucleotide repeat of length 8 nt would be (0.638)8 and the number of length 8nt A+T SSRs expected would be the frequency* (genome length/SSR length). To determine whether the composition of SSRs deviated from expectation based on overall nucleotide, dinucleotide and trinucleotide frequencies of the genomes (determined using FREQSQ ), we used a Chi-square test. Predicted number of each class of repeat was calculated as the ((expected frequency of a particular type of repeat, calculated as just stated)/(total of expected frequencies of all categories)) * observed total number of repeats. For example, in Huperzia, which has an A+T frequency of 0.638 and a G+C frequency of 0.362, the expected frequency of A+T mononucleotide repeats of length 8 is (0.638)8 and of G+C 8 nt mononucleotide SSRs is (0.362)8. The expected number of A+T mononucleotide runs, given that 147 mononucleotide repeats of 8nt and longer are observed in that genome, is (0.638)8/((0.638)8*(0.362)8)*147 = 145.44. We did simplify the calculations by basing our predictions on repeats of minimum length, which was also the mean and median length (i.e., we considered all the repeats that we observed to be of minimum length for these calculations). Shared and unique direct and inverted repeats were identified for eight angiosperm chloroplast genomes using the Comparative Repeat Analysis program . This program uses REPuter  but it has two additional features: it filters out repeats that are contained entirely within other repeats, and it identifies shared repeats among the input genomes by Blasting the repeats from each genome against all other genomes. For repeat identification, the following settings were used: (i) minimum repeat size of 30 bp; (ii) 90% or greater sequence identity, based on Hamming distance equal to 3; and (iii) an e-value of 2 for Blast comparisons against the other genomes. We thank Gwen Gage for help with Figure 3, Claude dePamphilis for Nuphar tissue, Romey Haberle for collection of Ranunculus tissue and help with DNA isolations, and Tom Cottrell and Kris Ernest for consultations regarding statistics. The comments of two anonymous reviewers helped improve the manuscript. The National Science Foundation (DEB0075700 to LAR, and DEB0120709 to LAR, JLB and RKJ) funded this work. Part of this work was performed under the auspices of the U. S. Department of Energy's Office of Science, Biological and Environmental Research Program, and by the University of California, Lawrence Berkeley National Laboratory under Contract No. DE-AC02-05CH11231. LAR conceived of the project, drafted the manuscript, conducted the SSR, nucleotide composition and codon usage analyses and helped with and coordinated other aspects of the project; RP finished the Ranunculus sequence, completed the annotations of the two genomes, prepared the GenBank submissions, made the comparisons related to ycf15 and ycf68, compared SSRs of Nuphar and Nymphaea, compared Nuphar and Ranunuclus with other genomes for gene content, gene order and start codon usage, and drafted manuscript sections related to her work; TWC performed the finishing and initial annotation work on Nuphar, conducted experiments to confirm IR boundaries, and helped generate genome map figures; CD performed comparisons between Nuphar and Nymphaea, the initial COA analyses of codon usage in Nuphar and Ranunculus, and drafted the manuscript section related to the Nuphar-Nymphaea comparisons; HMF and JLB generated the draft sequence for the two genomes; RKJ assisted in the preparation of the sequencing templates, helped with the annotation of Nuphar, performed the SDR analyses, drafted the SDR manuscript section, and contributed to the design of the project. All authors assisted with manuscript preparation and read and approved the final draft.